It’s tempting to want to get hiring done quickly, particularly if you’re understaffed and your current team is feeling stretched thin. However, absentmindedly filling open roles is simply not the way to go. You need to do thorough background checks, contact references, and look at previous work experience. The people you hire are directly involved in a patient’s health and well-being, meaning that rushing through the process is simply not an option. With social media becoming more powerful than ever, it’s likely that you’ll need to recruit in new and different ways. What worked in the ‘80s or ‘90s may not be the best options for hospital recruiting today. Post job openings via Twitter, LinkedIn, and Facebook. Ensure that candidates can apply to available positions online, instead of having to drop off their materials in person. Use your hospital’s website to advertise new job openings, as this is often the first place a person will look when they’re interested in working for your healthcare organization. Online traffic and social media should drive your recruiting efforts. This is where potential candidates are spending their time and attention, so you need to be there too. 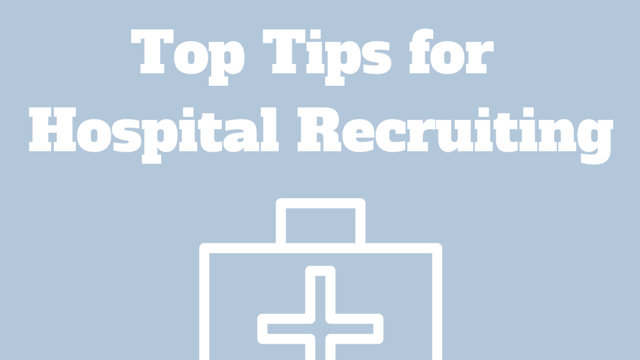 You may also want to consider using video interviewing technology to properly handle high volume hospital recruiting. Video interviews make it easy to evaluate a high volume of candidates without wasting time in the process. The one-way video interview, where candidate’s record their answers to interview questions, allows employers and recruiters to wade through tons of candidates while still getting a personal feel for the right people. In order to retain the employees you’ve hired recently, it’s important to provide support as they get adjusted to their new job. The first few weeks in a new position, particularly one in the medical field where stress levels are high, are crucial. If the recent hire feels as if they’re on their own with no guidance about getting adjusted, you may find that turnover rates become quite high. To prevent this from happening, setup a mentoring program or schedule regular check-ins where the new team member can have questions answered as needed. Just like a more traditional business, hospitals must always focus on recruiting new staff members in order to ensure that they’re filled with the most proficient and caring providers. Remaining proactive about these efforts prevents hospital administrators from winding up in a situation where they’re understaffed or filling open spots with less-than-stellar care providers.